The Giradora washing machine is an excellent reminder that innovation doesn’t always have to be about smartphones and web apps to impact on people’s lives. Hurtled into internet famedom by its entry into the Dell Social Innovation Challenge, the Giradora is basically a large bucket inside which there is a spinning mechanism powered by a pedal. 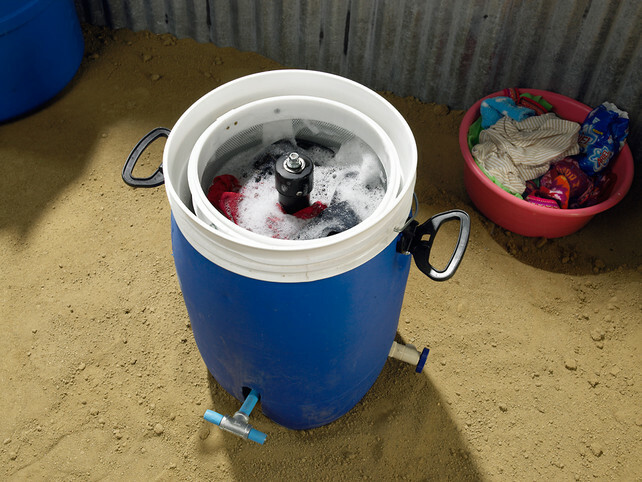 The user sits on the bucket and pumps the pedal to wash and dry clothes. A pedal-powered washing machine isn’t a new idea, but most efforts up until have been unholy marriages between bicycles and conventional washing machines. What gives Giradora the edge in the usefulness stakes is that it is light enough to be portable, so it can be carried close to water sources for use. The sitting position of the user also frees them up for other tasks and avoids causing back pain. The design was developed by students Alex Cabunoc and Ji A You of the Art Center College of Design, Los Angeles during a visit to the the slums of Cerro Verde, Peru, where they witnessed first hand the time and trouble expended by women hauling water and washing clothes by hand. They observed women spending up to six hours a day, three to five times a week on the laundry. Cabunoc says that the largest benefit is that the device frees up time, during which people can earn extra income or participate in education to “break the cycle of poverty”. The team are developing the product to be sold for under $40, a fifth of what the cheapest spin / dryer is currently available for and have received a $20,000 grant from US charity the National Collegiate Inventors and Innovators Association. It’s a great idea – the simplest ideas often provide the most attractive engineering solutions – and a reminder that some people have more fundamental problems than which touch screen device will integrate their contacts best with social media activity.